This entry was posted at 1:32 PM and filed under Case Study, General, Internet, Live, Participatory Culture, Technology, User-Generated Content, Video, Webcams, Websites. Thanks for the great post. We’ll be looking forward to continuing to read your insights! Very bad stickam ripoff. Poor content. Few users. Friends in high places? Must be due to this buzz, highly unwarranted. 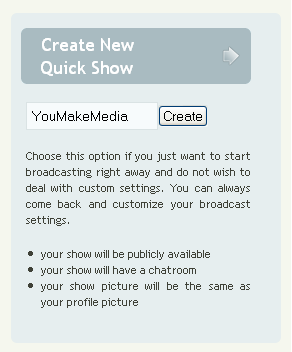 Looks as if Leo Laporte has moved to Stickam now. Lots of kids but at the very least not a ghost town like ustream seems. Mogulus is a good alt as well. As a video producer who uses Ustream, I would disagree with John Richardson about Ustream being a bad stickam ripoff. Ustream is a more serious, professional platform. Stickam is filled with kids making inane comments, especially when a woman is on the screen.